Paris’ golden age of advertising bred a bold, exciting new art form and changed the face of the city. When we think of fin de siècle Paris at the peak of modernity, a number of paintings may spring to mind. Choose any of Manet’s provocative canvases or Seurat’s renowned A Sunday on La Grande Jatte, Degas’ delicately rendered ballet dancers or Monet’s great, dusty train stations. These works speak of a city in the thrall of transition; they emphasise a fresh wave of cultural pursuits for the leisure classes, an interplay between public and private, and new modes of technology, transport and industry in full swing. 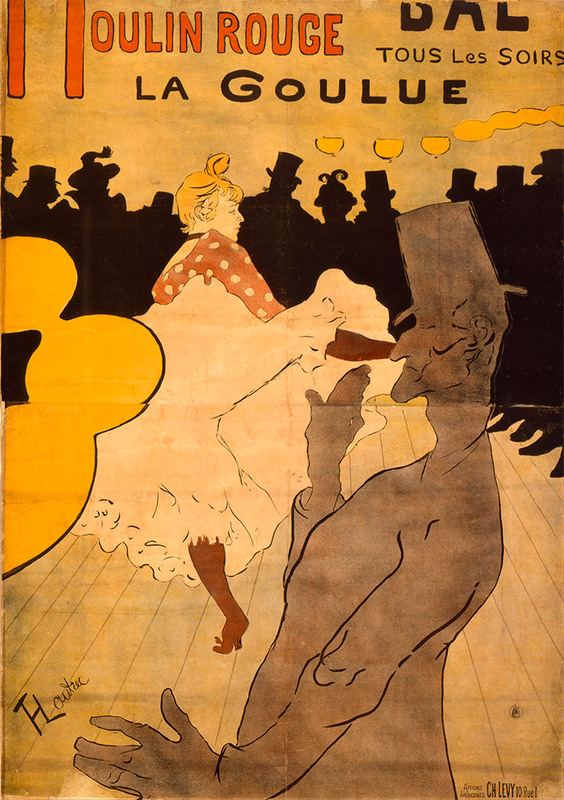 Toulouse-Lautrec’s graphic posters, which tend to be synonymous with the infamous Moulin Rouge, may cross our minds too. Perhaps most famous is his Moulin Rouge: La Goulue (1891), which shows a well-dressed man watching a flamboyant can-can girl as she dances by in a puff of her petticoat. Not only an emblem of one of the key pastimes of this era, posters such as this blur the line between high art and advertising. As scholars Kirk Varnedoc and Adam Gopnik explain, by the 1890s advertising had become an art form in its own right as key artists helped to elevate the poster to artistic status. Original posters were sold by the city’s art dealers as limited edition prints and posters were displayed in galleries and exhibition spaces like never before. These developments were, in part, due to new legislation in Paris that created a proliferation of posters, which completely changed the look and experience of the city. In 1871, French parliament sought to liberalise newspaper publishing rights, lifting censorship from the press and effectively expanding the Parisian poster market. A spate of new laws in the early 1880s eased legislation further, meaning new surfaces around the city which were now available to rent for advertising. These legislative changes went hand in hand with new technological advances in lithograph production, meaning posters were easier and cheaper to produce. New rules were made prohibiting the defacement or tearing down of posters, and companies no longer needed to register in order to advertise, meaning that smaller companies were now able to promote unique, unusual products. In a sense, this was a golden age of advertising, and as Varnedoc and Gopnik argue, a time when ‘issues to civic liberty and commercial expansion were knotted together’. What followed was a new freedom in poster advertising. It was seized upon with gusto by artists of the time as they broke away from salon exhibitions in the 1870s and '80s and embraced this new form of visual communication. Simultaneously, a new entertainment culture exploded – the cabaret, the circus, cafes and clubs, department stores and, most famously, the Moulin Rouge. There was now a whole new set of things to advertise, and many new cultural references to draw upon when marketing them. The cycle was self-perpetuating: as more posters were made, Paris became an increasingly image-driven, visually stimulating place to be, thereby inspiring more artists to create more posters. 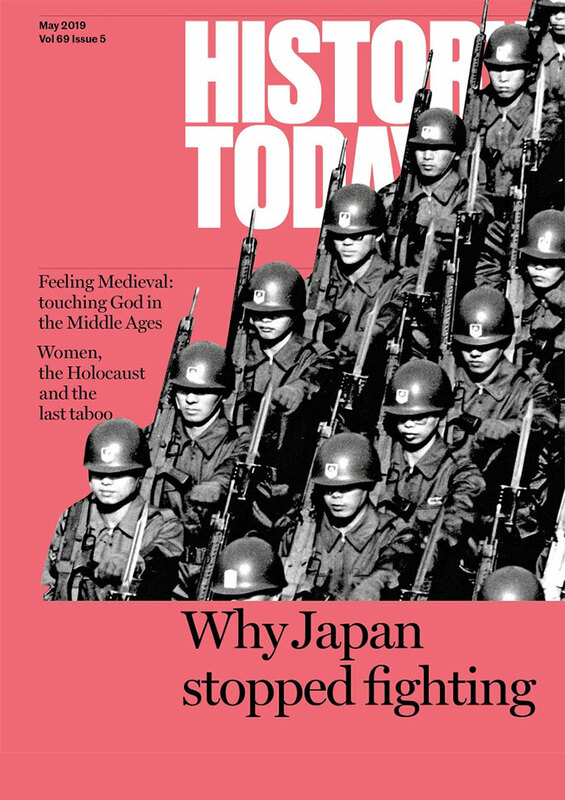 But it was not just the city that proved inspiring. The works of artists like Toulouse-Lautrec and members of the Nabis group, which included Pierre Bonnard and Edouard Vuillard, were explicitly inspired by the vibrant posters of Jules Chéret. Described by one commentator as an ‘evil genius’, a modern Frankenstein unleashing his monster onto the world, he is also known as the ‘father of the modern poster’. Chéret’s portrayal of a dancing girl in works such as Moulin Rouge (1889) or Fine Arts (1893) became an urban archetype, as the lively, floating figures – known as ‘Cherettes’ – conveyed the spirit of the new epoch. His Cherettes popped up everywhere: in Purgatif Géraudel (1891) we see her advertising a laxative; other times she is selling paraffin. Most famous is his depiction of her as Loïe Fuller, in Folies Bergère, La Loïe Fuller from 1893. These depictions of modern women influenced other painters greatly. In works such as Le Chahut (1889-90) and The Circus (1890-91), we can see Georges Seurat borrowing specific elements from these posters. Though Seurat dealt in paint, rather than print, we can see through his handling of the female form, his use of the dancing can-can girl and the air of lightness he incorporates, nods to Chéret. Pierre Bonnard was also inspired by these posters. Typically known for his soft pastels and warm interiors, he started off as a print-maker, producing the effervescent France-Champagne in 1891. 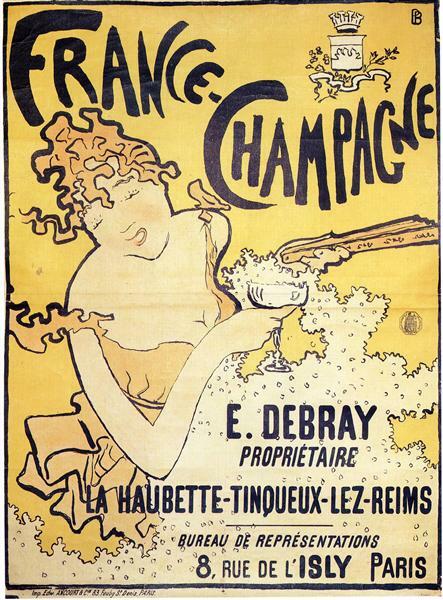 This poster encapsulates the lightheartedness and sense of easy delight that many saw as defining the era: a giggling woman throws back her head as she brandishes a coquettish fan, the slogan emerging from a fizz of champagne bubbles. The sense of joyfulness and gaiety was rife within representations of the new culture and motifs from Chéret’s posters can be seen in abundance in Bonnard’s early prints. In 1890, Bonnard met Toulouse-Lautrec and is credited with introducing him to the medium of the poster. Having already exhibited paintings in Paris, from 1891 Toulouse-Lautrec began prolifically producing prints. As biographers and historians of the artist argue, despite the criticism of his peers he had no qualms producing posters rather than painting; as a great marketer of his own work, he enjoyed the additional income that it gave him. 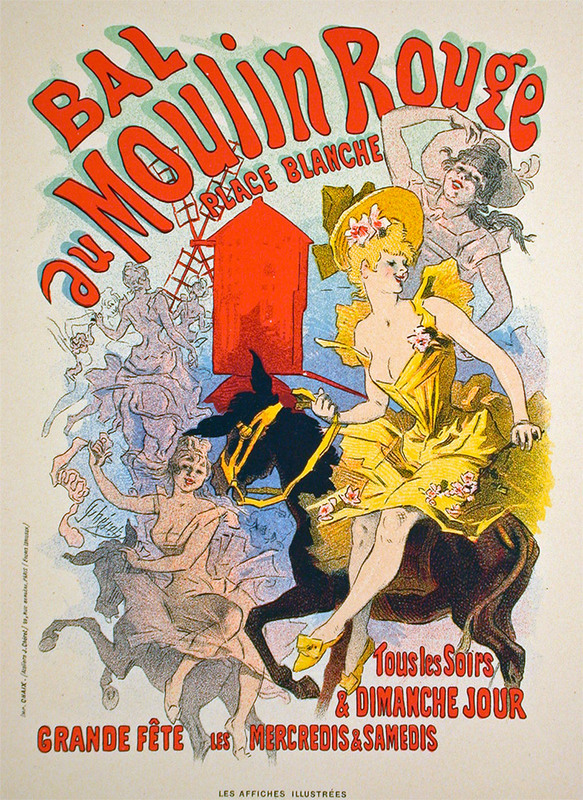 From the bohemian idyl of Montmartre, he worked tirelessly, and when the Moulin Rouge opened he was commissioned to produce a series of posters – the first being his famous La Goulue. Other works, such as At the Moulin Rouge (1893), showed the urban crowd and the interiors of the club. Despite his subsequent venture back into oils, with stunning works such as La Toilette (1896), his paintings still captured a sense of the zeitgeist, tending to deal with representations of prostitutes or dancers in evocative, straightforward terms. 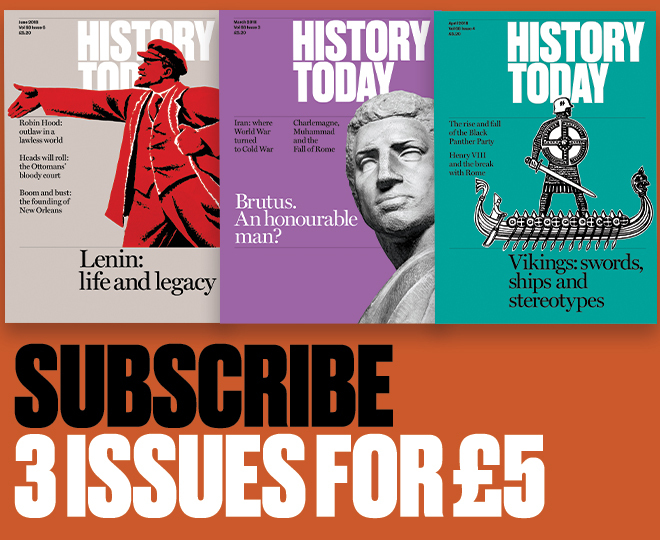 As art historians Paul Jobling and David Crowley have observed, these posters were not merely displayed on walls of buildings but in exhibitions and gallery spaces. In this way, fin de siècle artists like Chéret, Toulouse-Lautrec and Bonnard were crucial in elevating the simple poster, creating iconic characters and easily accessible narratives. By the end of the 1890s, it was the posters themselves, rather than the products or experiences that they described, that were in popular demand. Today, the posters live in the great art collections around the world and Chéret even has the principle art museum in Nice named after him – the Musee des Beaux-Arts Jules-Cheret. Anna Jamieson is a Masters student of Art History and Visual Culture at Birkbeck, University of London.